Ram Charan is currently busy with his on-going film 'Dhruva'. Surendra Reddy is directing this action thriller. Mega Power Star is doing a powerful police officer role. He gone through complete make-over to get into the character. He even followed a strict diet to fit the bill. shoot in Kashmir. Few crucial scene and one song has been completed. Hero Ram Charan has just landed in Hyderabad. Makers has planned to release the First look poster of 'Dhruva' soon, but one on-location still is making rounds in Internet. Ram Charan's stunning look amazed the whole world. Mega fans and movie goers are going gaga over Ram Charan's look. Popular production house Geetha Arts banner is produing this action thriller film. Rakul Preet Singh is the lead lady and Arvind Swamy is doing the villian role. Beautiful story and gripping screenplay will be major highlights in the film. 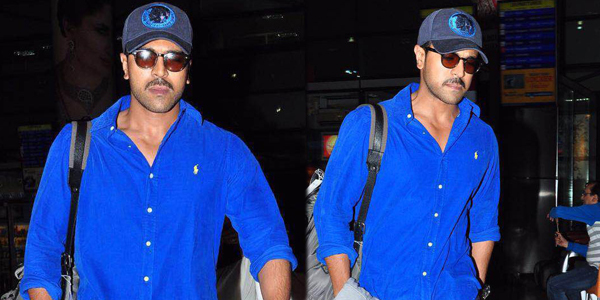 Here are the few snap shots of Ram Charan clicked at Shamshabad airport.